The Degani Ensemble was first formed in the mid-1980s by a group of young musicians keen to explore a wide variety of chamber music for wind and strings. 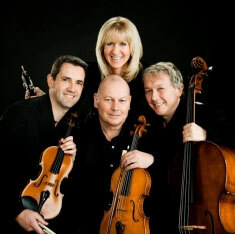 Initially based around oboe and string trio, the group diversified into larger scale chamber music in the 1990s, but was re-formed in 2005 by founder members Ruby Ashley (oboe), Alan Smale (violin) and David James (cello). John Lynch (viola) was subsequently added, bringing a wealth of chamber music experience to the chosen repertoire. The ensemble has recently been joined by multi-award winning soprano Cara O’Sullivan. have taken her all over the world. Spanning an impressive and wide-ranging repertoire, she has been referred to as ‘The Irish Superstar of her generation’ by the Irish Times.